The most circular thing about Ikea, the Swedish furniture retailer, has traditionally been the path that it makes customers follow through its superstores to find the goods they have driven there to buy. As they wander along its displays, Ikea wants them to spot other decorations and take them home too. The “circular economy” now means something else: the reuse and repurposing of products in different ways. Ikea disclosed this week that it not only wants to recycle more furniture, but plans a trial in Switzerland this year to lease desks, chairs and perhaps kitchens. Instead of acquiring furniture cheaply and later throwing it away, customers might lease it for a while and then upgrade, with the old pieces being refurbished for other users. No one buys Ikea furniture to pass on to the next generation — it is rarely moved from the spot where it is put together. That is not the point — like fast fashion clothing and other goods made in China, it has been cheap enough to treat as disposable rather than as an heirloom. But even Ikea shows signs of doubting whether this approach can endure. “We don’t want people to be attracted by old things. We want them to like the new ones,” says Mustapha Mond, a controller of the dystopian society in Aldous Huxley’s 1932 novel, Brave New World. The attitude also applies to companies that make consumer goods — the more sales, the better. To escape our own dystopia, it needs to change. The velocity of consumption has steadily risen, partly because companies such as Ikea make buying stuff easy. Sofa and televisions were once hefty household investments but can be bought cheaply now. About 100bn garments are made each year — 14 for each person — and they are kept for only half as long as 15 years ago, the consultancy McKinsey & Co estimates. This causes a lot of damage. Each person in the world draws about 10 tonnes of raw materials from metals to biomass annually into the economy to support consumption and production, according to the Ellen MacArthur Foundation, which advocates a circular economy. Much of it will end up as waste, given how hard it is to reuse — only 14 per cent of plastic packaging is taken for recycling, and far less actually recycled. Few companies would stay in business if they only made goods that lasted a lifetime. But plenty can do more to limit repetitive consumption. 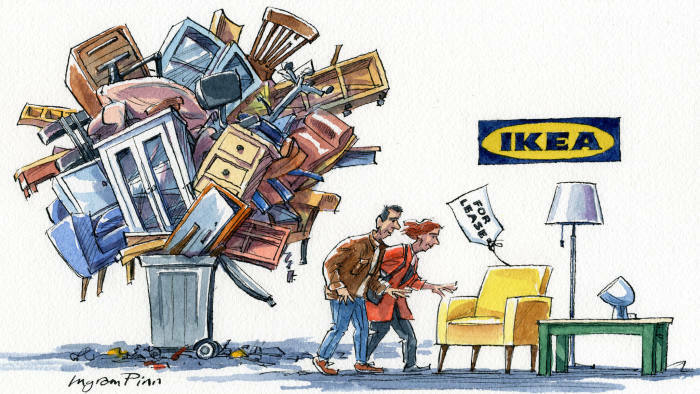 They have selfish motives to try, as Ikea and others are doing: young consumers enjoy buying things but many are environmentally conscious (at least in theory) and are repelled by waste. Companies can start with packaging, too much of which is made from complex plastics that ends up in landfill or the world’s oceans. Reusing a tiny sachet with a pullback plastic lid is very tricky, and recycling in general is more expensive following China’s crackdown on imports of waste last year. More containers should be refillable, like the glass bottles brought to my door by our milkman, and SodaStream’s carbon dioxide gas canisters for bubbly water. Packaged goods groups including Nestlé and Procter & Gamble plan to experiment this year in London, Paris and the US with refillable brand packaging through a start-up called Loop. Packaging is only one of the excesses in the way that products are marketed and consumed. Not only are things bought and disposed of rapidly, but many are used sparingly while their owners have them — in Europe, the average car is parked 92 per cent of the time and 31 per cent of food is wasted, McKinsey estimates. Consumers can learn a lesson from the way companies often lease equipment and goods, paying by usage rather than for objects themselves. That applies to photocopiers made by Kyocera and Xerox, while the flooring company Desso leases office carpets — cleaning as well as fitting. More things could be rented by individuals, as technology has encouraged. The internet makes it easier to share occupancy of cars and apartments through Uber and Airbnb, and people subscribe to music and other digital services rather than buying discs. People lease cars for three or four years and there is no reason why more durable goods, including furniture, cannot be rented. Not only does it limit waste but it gives companies an incentive to make things sturdily — better materials would require fewer repairs. The circular economy has pitfalls, notably the so-called rebound effect: the easier it is to use products, the more intensively this will happen. That is not a problem for furniture, but sharing cars can exacerbate congestion and pollution rather than curbing it. But the reuse and refurbishment of goods has enormous benefits compared with things being sold once, used for a time and then dumped. At best, recycling involves breaking things into raw materials and, in effect, discarding all the investment and labour that went into their making and marketing. If Ikea aspires to become circular, there is no reason why others should not follow. It will be difficult to reform the consumption habits of the past few decades but all of us — consumers and companies — can try. IKEA Wants to Make a Home Version of "Alibaba", Selling its Own Furniture and Selling Competitive Products.